You may recall from our first blog on glaucoma that this eye problem isn't really just one disease but a whole bunch of different diseases lumped together that have a similar effect on your eyes and vision. That makes it relatively difficult to explain in a non specific way (though I tried in my introduction to glaucoma blog)! To really understand it we have to talk about each type of glaucoma separately. Let's start with one of the most common types of glaucoma: primary open angle glaucoma. So who gets this type of glaucoma? The short answer is anyone can get open angle glaucoma. Typically your risk is higher if you're of African descent, if you have a high nearsighted prescription or if you have a family member who has glaucoma. Our risk goes up with age too. The thing to take away here is that these factors increase your risk of the disease but you can't say "Gosh, I don't have any of those, I'll never get glaucoma". One person may have a lower risk than another but we all have some risk of developing glaucoma. Alright, here's a really quick anatomy lesson (with pictures) that is absolutely required to know what's going on in glaucoma. Basically fluid is produced by the ciliary body which you can see in the picture below. That fluid flows up through your pupil and then drains out through the little corner formed between the cornea (front clear part of your eye) and your iris. 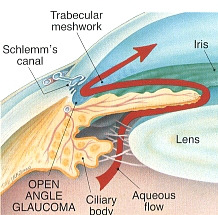 This is how an eye without glaucoma produces and drains fluid (known as 'aqueous humour') in the eye. If you have open angle glaucoma fluid is still produced by the ciliary body and flows up through your pupil but when it goes to drain it doesn't drain as quickly or as well and so the fluid stays in the eye longer. The more fluid that remains in the eye and the slower it drains the higher the pressure in the eye becomes and the greater the chance for damage to the optic nerve and your vision. If someone develops open angle glaucoma the fluid produced can't drain as quickly and stays in the eye longer increasing the eye pressure which can lead to damage and permanent vision loss. So why doesn't the fluid drain as well? Good question. If you figure it out let me know and we can alert the Nobel Prize committee together. 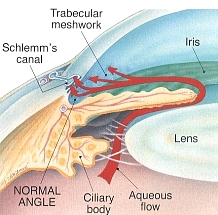 There are some types of glaucoma where the drainage gets clogged but those are secondary glaucomas (meaning they are caused by another problem like debris or physical damage preventing good fluid drainage) as opposed to primary glaucoma (the fluid isn't draining but there aren't any other diseases happening to blame it on). There are some great theories out there including some that suggest that the very tiny blood vessels that this fluid drains into may collapse or partially collapse leading to a decreased ability to drain fluid away but so far we don't know for sure why primary glaucoma happens. Regardless of what causes it, glaucoma is treatable. Usually all that is required is one drop of medication once a day to control the pressure. In order to treat the disease and prevent vision loss though you have to know you have glaucoma! The MOST important take away is that primary open angle glaucoma has absolutely no symptoms until it's end stage and vision loss is severe. The only way to diagnose glaucoma and prevent severe vision loss is to have regular eye exams with your optometrist. If you want to read more feel free to check out the following links or as always you can contact us on Twitter, Facebook, Google +, via our website or phone us at (403) 474-6744. You may have heard of glaucoma, or maybe not. However, you should know that while this disease affects over 250,000 people in Canada - only half of them know it! This is important because glaucoma is the second most common cause of vision loss in people over the age of 65. Glaucoma has no symptoms and the only way that glaucoma can be detected is through regular eye exams. So I hear what you’re thinking. I’m not 65. Why do I care? Well, just because glaucoma is the second most common cause of blindness in people over 65 doesn’t mean it only strikes people in that age range! One in two hundred people under the age of 50 are also affected. Glaucoma doesn’t have symptoms, at least not until the disease is end stage. So what does it do? Glaucoma causes a slow, symptomless, painless loss of your peripheral vision. Peripheral vision, or the sight you have all around what you’re looking at directly, helps you know your surroundings. It helps you detect the cars around you when you drive, it helps prevent you from hitting your head on objects above you. Basically it helps you maneuver in your world. This is what tunnel vision looks like. Since the vision changes happen slowly most people with glaucoma have no idea they're losing vision. So where does glaucoma come from? What causes it? Those are very complicated questions for later blogs! The short answer is we really don’t understand exactly where glaucoma comes from. We know that if someone in your family had glaucoma your risk goes up. Certain groups of people, those with certain types of vision prescriptions, age and gender all can play a role. One of the problems with really nailing down a definition is that there are many types of Glaucoma. There really isn’t any one thing in common across all the different types of glaucoma except that there is damage to the optic nerve causing loss of your peripheral vision. The best prevention is seeing your Optometrist for regular eye exams. Get checked, and ask them about your risk for glaucoma. If you have any questions about this or anything else feel free to contact us on Twitter, Facebook, Google +, via our website or phone us at (403) 474-6744. To learn more about glaucoma check out the links below.